Looking to rent a boat for the summer fun? Boys Toys Rentals specializes in boat rentals in The Phoenix Metro area. Since 2012 we have served the valley with all their rental needs and equipment. 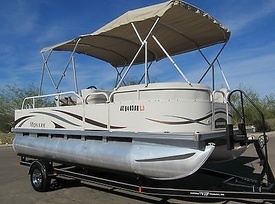 Located in Tempe we are able to deliver the boat to you or you can pick it up, either way get ready for the water fun. Our staff cleans and disinfects our rentals after every return and before the next renter uses it to ensure our customers are getting a well cleaned machine. Our goal is to provide our customers with quality rentals at an excellent price. With multi day discounts we are the one-stop shop where you can get all your summer water fun underway. For tubing and wake boarding around the waterways, you want to check out ourYamaha AR210. It packs a punch but is still enjoyable for everyone.Our Pontoon Boat Sun Tracker 27′ Party Barge Regency Edition provides a more open space so every can enjoy the leisurely cruise. For those who seek the ultimate vacation and relaxation, our Pontoon Boat is the Cadillac of boats coming in at 20’ long. With enough room to have everyone sitting comfortably and having a great time, imagine you and your family enjoying the water and sun while getting away from the city for the weekend to relax. Popular lakes where our rental equipment is used includes: Apache Lake, Roosevelt Lake, Canyon Lake, Pleasant Lake, Saguaro Lake, and Bartlett Lake. At Boys Toys Rentals our boats are equipped with power steering and the coolest wakeboard tower, tube, sound system, Bluetooth and built in cooler at no extra cost. Explore the great lakes of Arizona in style and comfort with friends and family. Boys Toys Rentals is the way to go. Call us today for your boat rentals and start having fun in the sun.